What can Harvard learn from the Midwestern university's bold building boom? 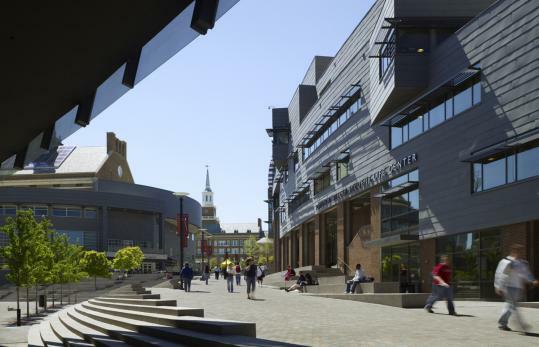 CINCINNATI - Harvard is building a new campus across the river from Cambridge, in Allston. How should they go about doing it? Should the new architecture be daring and inventive? Or should it replicate the so-called "Harvard brand" - buildings of red brick with white cupolas, in the 18th-century style known as Georgian or Colonial? That was the suggestion made to Harvard's new president, Drew Faust, by an audience member at a conference on city planning earlier this month. Faust gently demurred, saying the new campus would be different from the old but harmonious with it. What that means, time will tell. I was thinking about these questions last week, while visiting the American school that's undoubtedly built more buildings in less time than any other in the last 15 years or so: the University of Cincinnati. Twenty years ago, when I last saw it, Cincinnati was a hilly wasteland. Vast parking lots surrounded a miscellany of buildings of many shapes and styles. Since then, the university has been building like crazy. There are green quads where the parking used to be. And architecturally, Cincinnati feels as if it must have hired every famous architect in the world. The campus is a celebrity party of what real-estate ads are now calling "signature architects." Is this the way to go? Well, it's certainly interesting. There are, for starters, lots of Boston connections. There's a superb music building by Henry Cobb, the architect of our Hancock Tower and Moakley Courthouse. A fine administration building by Leers, Weinzapfel, the Boston firm that won the national "firm of the year" award from the American Institute of Architects for 2007. A utility plant by Cambridge Seven. A frat symbol in the form of a 65-foot tower that looks like a Cubist totem pole, by Bostonians Machado & Silvetti. There are major buildings by two winners of the Pritzker Prize, architecture's equivalent of the Nobel, Frank Gehry and Thom Mayne. Architecture buffs will recognize other names, like Michael Graves, Peter Eisenman, Charles Gwathmey, Bernhard Tschumi, George Hargreaves, Buzz Yudell, Wes Jones, Laurie Olin . . . The list seems endless. What it all adds up to at Cincinnati is a heady air of both excitement and confusion. At the center of the university is now something called Main Street, a paved pedestrian walkway that climbs, curves, and steps its way through the middle of the campus like the main drag of an Italian hill town. Main Street is part of a loose master plan for the university, done in 1991 by Hargreaves, who later chaired the department of landscape architecture at Harvard. Big bold buildings belly up to Main Street on every side. They push and jostle at one another. There's no feeling of architectural politeness. Quite the opposite, in fact. There's an obvious love of congestion. Things crash together, often at bizarre angles. You get the sense of the colliding multiple initiatives of city life, rather than the calmer, more pastoral image sought by many universities. This love of congestion is most obvious in the Lindner Center, a white curvy concrete mass that looks more like a power plant or a bridge than a college building. Its architect is Bernard Tschumi, former dean of the architecture school at Columbia. Tschumi was told he could site his building (it's a faculty club and athletic center) anywhere he wanted. He chose to jam it, quite unnecessarily, into a tight leftover space where other buildings press up very close on three sides. I'm not sure I buy congestion as a general principle of college design. But I loved the Lindner. And that's the paradox of Cincinnati: To gain excitement, drama, daring, and an almost rock-culture explosion of things happening, you pay a price. The price is confusion on the one hand, and, at times, a sense of being overwhelmed. You're overwhelmed, for example, by the biggest of these new buildings, a multi-purpose pile on Main Street called the Campus Recreation Center, by Mayne. The very talented Mayne, for some reason, loves to design grim buildings. This one is gloomy, without much daylight, and the materials are gray concrete and gray metal siding. As you walk around, you often find yourself in shadow beneath some heavy chunk of architecture that's passing over your head like a freeway ramp. Light and color, or a sense of natural materials, would have humanized the experience. In one way, Cincinnati is like MIT. MIT in recent years erected some inventive (and expensive) new buildings by signature architects like Gehry and Steven Holl. "The MIT buildings are a series of experiments," said William Mitchell in 2004, the year he stepped down as dean of MIT's school of architecture and planning. "You learn from bold experiments." One of the things MIT is learning from bold experiments is that things can go wrong. The institute is currently suing Gehry over alleged design flaws in his dramatic Stata Center. Is that also the future for Cincinnati? I was told that the innovative building program has come to a screaming halt, amid rumors that the university is using its endowment to pay overdue construction bills. Meanwhile, some of the earlier of the new buildings, such as Peter Eisenman's flimsily built Design and Art school of 1996, are already in need of serious repair. Maintenance costs at Cincinnati are going to be high. That's true of most experimental architecture. And the most avant-garde design is, often, the one that dates the quickest. Lessons? I want it both ways at once. Harvard in Allston should possess some of the charge of urban energy you get at Cincinnati, the kind of feeling I've always associated with big-city schools like New York University. But it doesn't have to look like a world's fair of self-expression by individual architects. And Harvard should make buildings that are durable both physically and culturally. A postscript: Yet another signature architect, the Iraqi-British Zaha Hadid, is the designer of Cincinnati's new Contemporary Arts Center, in the city's downtown. As far as this critic is concerned, it's a bomb. Robert Campbell, the Globe's architecture critic, can be reached at camglobe@aol.com.